Organizational success is clearly linked to good leadership. But, what’s often forgotten is the need for good followership. Simply having followers is not sufficient. One of the things that good leaders and bad leaders have in common is that they both have followers. Barbara Kellerman in her book, Bad Leadership, identifies reasons why people follow leaders regardless of their goodness or badness. These reasons range from having their needs met as individuals, as members of groups, or by satisfaction of their personal interests. But good followership distinguishes itself by certain traits of the followers and of the leaders. Furthermore, good leaders nurture those traits and qualities in themselves and in their followers. In Followership: Leading Is A Skill; So Is Following, by Alden Solovy, several traits and behavior themes of good followers are identified: self-management, communication, teamwork, personal development, commitment, credibility, honesty, and courage. These behaviors and traits are linked to organizational success. Interestingly, John C. Maxwell, in The 21 Indispensable Qualities of a Leader, leadership skills associated organizational success are consistent with critical followership skills: self-discipline, communication, servanthood, teachability, commitment, character, generosity, and courage. Leading in the today’s difficult climate of stress and change demands that leaders pay more attention to this. One of the key leadership attributes that Woodard and Tager discuss in Leadership in Times of Stress and Change is the need for empathy: the ability to put yourself in the shoes of your followers and to really know and feel what they are going through. These soft or people-centered skills may appear to be an inadequate substitute for outcome oriented leadership and followership behaviors – especially in an engineering culture as NASA. But it can make a real difference to outcomes and productivity during today’s turbulent times. After all, it was honesty, sincere communication and commitment of a brave little boy that helped the unclothed emperor see the leader that he needed to become. I had the privilege of tutoring incredible lady in college Algebra the same week that I had to be on a Cloud Computing panel at FOSE. First, I must say that though we both got very little sleep, I’m so happy that Shakeba did well on her final. But it occurs to me that the advice that I gave to her to coach her through her astounding moment … just take the next step … is the same advice that Government IT Leaders need to follow with respect to leveraging value from this astounding technology. [T]here is little or no evidence of government agencies being ready to move beyond this and move mission-critical datasets into the cloud as part of an enterprise-wide strategy. Government cloud-computing environments have common IT risks in areas such as data privacy, portability, access, loss and security as well as fears of vendor lock-in. Because of cloud computing risks, federated government-owned/controlled cloud computing arrangements may have greater chance for short-term viability. Forrester spoke with more than 30 companies in this market to determine its worthiness for enterprise consideration and found that it provides a very low-cost, no-commitment way for enterprises to quickly get new services and capabilities to market that entirely circumvents the IT department. Infrastructure and operations professionals can try to ignore it as it is just in its infancy, but doing so may be a mistake as cloud computing is looking like a classic disruptive technology. I’d like to say it a little more bluntly. If CIOs don’t get ready, manage fears and manage their risk, they will get run over by this disruptive technology. Your organization is doing it anyway – without you! So do something! You don’t have to move your entire enterprise into the cloud, just take the first step and look at some appropriate datasets. This doesn’t have to be an all or none decision. When making vendor choices, go in with the end in mind. I guess no one likes to enter into a marriage with a prenuptial agreement in the event of divorce, but then after all, this is your enterprise. Don’t confuse control and ownership with security and viability. And for crying out loud, please make sure that you have a healthy – ok … semi-healthy governance process. Don’t be afraid, but don’t be a hero either. Make sure you have a good sharp pencil with an eraser. Follow sound mathematical principals, and you will always be fine. CIOs should not run and hide. The great possibilities in this disruptive technology merit us taking the next stops. Those of us who ignore it, will fail or be left behind. It is ironic that as a discipline, IT arguably ?inflicts? more change on an organization and on a society than almost any other discipline. So, here I am, leading an IT organization through a change and thus, need to give a lot of thought to my difficult task of leading myself, them and us successfully through a successful organizational change. The change affects individuals; it is personal; it is scary; it feels like death. The fear of change is clearly expressed in both folklore and fiction. In folklore, changelings were children who were substituted for parents? real children. In superstition, a changeling was suspected when any unexplained or bizarre change occurred in a child or infant. Those of you who have read earlier posts know that I am a proud introvert. When I was a little girl, the worse thing that my mother could tell me was, ?Go outside and play!? A fate worse than death. But, every now and then, in our close-knit neighborhood in Northeast Washington, DC, a new person would move in. Surprisingly, this introverted little girl would eagerly go outside and say ?Wow, someone new to play with!? So when I found out that Goddard Space Flight Center was getting a new Center Director, I couldn?t help but revert back to my childhood and think, ?Wow, someone new to play with!? Curiously, when I made some changes in my leadership team, and changed some positions around, an employee came to complain about why she had to cope with a new supervisor. Compare and contrast my thinking about my new boss and her thinking about her new boss. Humm, I am leading people who are not like me. So, I guess I need to change and need a change strategy that takes people like her into account. * Hurt enough that they are willing to change. * Learn enough that they want to change. * Receive enough that they are able to change. Philately. A postage stamp that, by accident or intention, has been chemically changed in color. I need a plan, not by accident, but by intention. I need a masterpiece that changes the color of the organization. A portrait that paints a picture of change that transforms me, my stakeholders, and the my organization. Time to get out my palette, colors, and canvas and get busy. When I first became the CIO of NASA?s Goddard Space Flight Center, I noticed that our tagline was, ?To Serve Our Customers?. I chuckled to myself when I recalled one of my favorite TV shows, The Twilight Zone. 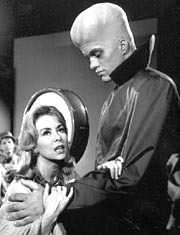 There was an episode titled To Serve Man. It was about seemingly friendly, humble, and servile aliens from outer space that wanted to be helpful. It turns out they really wanted to serve ?man? for dinner. We don?t eat our customers alive, do we? Of course not! However, it made me think — what does ?serve? really mean in the customer context? Do we assist them or do we consume them? In Nucleus Top 10 Predictions for 2008, this was supposed to be a tough year for irrelevant CIOs. Today?s IT customers are savvier. With the widespread availability of things like wikis, blogs, and other on-demand applications, their need for the IT department has greatly diminished. They will have their needs satisfied whether or not the irrelevant CIO likes it or not. A 2007 IDC survey, Are CIOs Irrelevant to Enterprise 2.0, shows that for business use of Web 2.0 tools, nearly two-thirds of the tools used for business purposes were NOT managed by their corporate IT organization. CIOs can take their 18-month software development cycle and shove it! So is it better to be irrelevant or forgotten? Let?s look at being forgotten for a second. My model here is the Maytag Repairman. I love the commercial where the Maytag Repairman is in the office and someone gets a little nervous about the possibility that the fridge is down. But, the repairman is fixing the copier and notes that they will need toner soon. Delivering quality, which is in the eye of the beholder, gives us a chance to get into the head of our customers and find out what they really need. Quality is absolutely necessary, but not sufficient. So thanks for your 5 nines Ms. CIO, what else do you have? Discussing the impact of Software as a Service (SaaS) in Why SaaS Could Make Your IT Skills Irrelevant, CIO.COM challenges irrelevant IT organizations to behave more like IT Special Forces rather than IT Infantry ? we insert ourselves with surgical precision at the right place at the right time ? we get in and get out ? leaving a job well done ? on to the next mission. Maybe Janet Jackson got it right, ?What have you done for me lately?? True service to our customers requires customer empathy not just sympathy. We have to get into our customers? heads to understand and experience what they feel. The need for a relevant CIO or IT organization won?t go away, but we will be challenged to continue to evolve and possibly operate in new ways to ultimately serve our customers. Last week Goddard Space Flight Center was treated to a visit from Joe Klimavicz, the CIO of the National Oceanic and Atmospheric Administration (NOAA) and 25 people from his office. I must admit, that I’ve always had a soft spot for NOAA. That’s where I had my first job as a civil servant – as GS-2 Student Assistant Cartographer. That’s also where, after ruining another nautical chart, wiser veterans pried a pen out of my ink-stained left hand and banished me permanently into the purgatory called Information Technology. 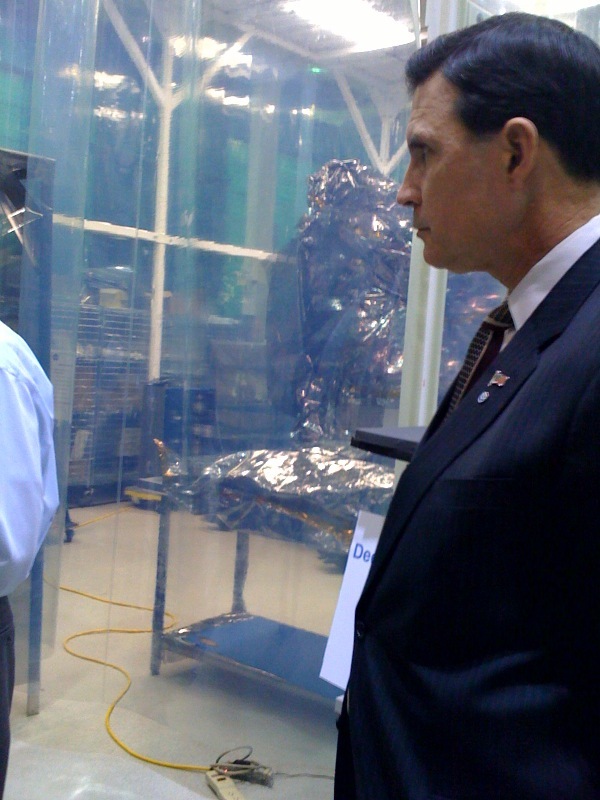 Bobby German, Acting CIO of NASA, and I gave a brief overview of the IT challenges at NASA. Joe with concurrence from his crew remarked that he could have given the same overview – except instead of saying NASA or Goddard, he would say NOAA. Remarkable? Not really. As I type this, I am on my way to the Department of Energy (DOE) CIO Conference. Sadly, because of weather delays, I missed the opening remarks from CIO, Tom Pyke. But after doing a gig myself at DOE, I know that he could have given the same overview that Bobby and I gave – except instead of saying NASA or Goddard or NOAA, he’d said DOE. So, I wonder, in the words of Rodney King, “why can’t we all just get along?” In other words, ineffective IT governance is the Garden of Eden for almost all of the IT problems that we have – How we make decisions? Who makes decisions? How we inform those decisions? Seems like an easy thing to figure out, right? But I suppose if it were easy, we would have already done it. It also seems point to another Garden of Eden conundrum and boil down to individual accountability and that free will thing again. Sure we need policy to tell us what is right and wrong, but policy won’t protect us from individuals who, whether from ignorance or defiance, make the wrong choices from a security perspective. But, we do we continue to struggle as a collective don’t we???? As I muddle through this blog, I’m sitting next to Bob Carter, VP of Federal Sales from a company that sells security technology to government. Like me, he was on his way to the DOE CIO Conference. I told him what I was blogging about and asked his opinion after cautioning him to please not try to sell me anything. While he assured me that technology was a necessary component of the solution he cautions that throwing a bunch of technology at it wasn’t the answer either. I chuckled to myself ironically wondering if his assertion will still provide them a viable sales pipeline – but mercifully he was candid, a cool dude and a straight shooter. Who knows, but we need to be able to pull together and figure it all out. And if as Bob suggests, technology is the first line of defense, maybe we need to also look at people – partnerships and individual accountability … and processes – governance and risk-based strategies. That’s why I was excited about meeting with NOAA and why I was excited about the DOE CIO Conference. Maybe we can work together where all of us are smarter than each of us. Perhaps collectively, we can find a way for IT to help our respective missions better serve this country … even this planet.